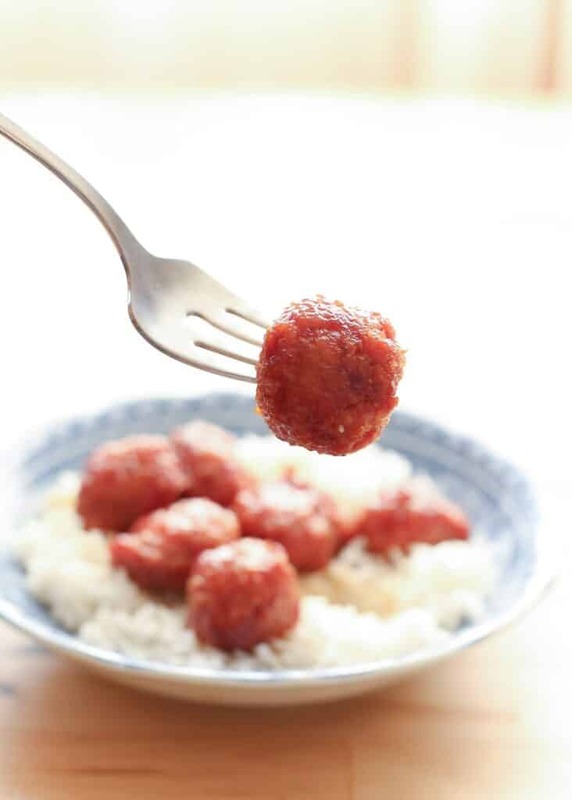 Savory ham meatballs are coated in a thick, sticky, sweet and sour glaze and then baked in the oven until piping hot and irresistible. You know those foods that stick in your memory? These ham balls are one of those recipes. I tried one when they were still piping hot from the oven. I burned my mouth and then, despite the burn, I ate another one while they were still way too hot. They are that good. My family loved them and they managed to eat this entire batch of meatballs in less than 24 hours. I’ve been making these ham balls for a few years now and they still disappear almost as fast as they cool from the oven. My whole family cheers when they know I’m making a batch. They freeze beautifully too, so don’t hesitate to make the full batch. If you’ve never ground your own meat before, do not be intimidated. The first time I made these meatballs it was a first for me as well. I bought an inexpensive meat grinder just for this recipe. It is super easy to use and well worth having. You know how there are recipes that are on your radar for a while and then when you finally make them you wonder what took you so long? These Ham Balls were one of those recipes. I have my friend Sue’s Bourbon Meatballs on my meal plan for next week and I strongly suspect that they are going to be a similar story. Don’t they look incredible? Kitchen Tip: I use this scoop, this meat grinder, and these baking dishes to make this recipe. Preheat the oven to 350 degrees. Lightly grease (2) 9x13 baking dishes with oil and set aside. Use the coarse setting on your meat grinder to grind the leftover ham. If you don't have a meat grinder, you can use a food processor to pulse until it is chopped like hamburger meat. Combine all the meatball ingredients in a large bowl and mix with your hands until combined. Roll into 1 1/2" - 2" meatballs. I use a medium size cookie scoop to scoop them all the same size before smoothing them with my hands. Arrange the meatballs in the baking pans and set aside. Whisk together all the glaze ingredients in a medium size saucepan over medium high heat. Bring to a boil, whisking until the sugar has dissolved. Reduce the heat to medium and simmer for 4-5 minutes, until the sauce has thickened. Pour the glaze over the ham balls, dividing it between the two pans. Bake the ham balls, uncovered, for 75-85 minutes, until the ham balls have browned and the sauce has reduced to a syrupy consistency. Enjoy! 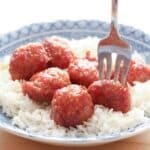 FREEZER MEAL: Let the meatballs cool and then transfer to a freezer safe Ziploc or an airtight container. Pour all remaining glaze over them and press out any air. Let thaw in the refrigerator before reheating covered in the oven, on the stove-top or in the microwave. If you've never ground your own meat before, do not be intimidated. The first time I made these meatballs it was a first for me as well. I bought an inexpensive meat grinder just for this recipe. It is super easy to use and well worth having. I wonder what other sides would go well with these for Easter dinner. We love them with roasted and/or glazed sweet potatoes and/or carrots! Mashed sweet potatoes, rice, bread... Shoot. I feel like Bubba in Forest Gump now. Whoa baby... Those hamballs look fabulous. And now I can't wait for next weekend to get working on these. Must. Make. Hamballs! I've always wanted to try ham balls! I'm skipping a big ham this Easter so I think these are going on the menu. Yum! These sound really good but I must admit to never having heard of ham meatballs, so I learned something here today. I can see why these would be delicious! I've never heard of a hamball! Now I have another meatball to add to my growing collection, pinned! Would a food processor work? I'd recommend finding a different recipe to make. Ham is also pork, so this is simply not an adaptable recipe. Is the 3 1/2 cups brown sugar correct. Sounds like a lot. Yes, the amount is correct. Much of that is glaze that won't all be absorbed by the meatballs. Made these...brought back memories of 25-30 years ago. A Mennonite woman made this mixture and sold it at her family's County store. She passed away and I've tried so many Recipes and never got "that flavor" ! Well, this is it!! Thank you!! I'm making a pineapple stuffing to go on the side with these hamballs...will go great together. 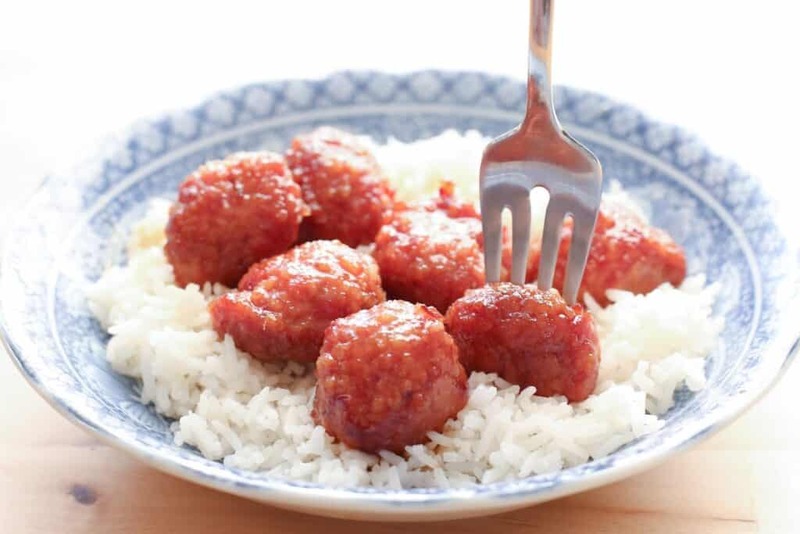 You can also do a pineapple glaze/sauce on the meatballs.